Grown without reliance on artificial chemicals and fertilisers. 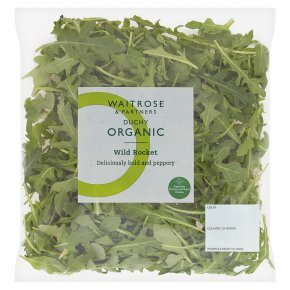 Good Food - Organic rocket, grown by specially selected farmers with a commitment to quality. Delicious in a salad with balsamic dressing and shavings of parmesan. Good Farming - Organic farming works with nature using methods such as crop rotation and clover planting to build fertility in the soil. Good Causes - Sales of Waitrose Duchy Organic products provide a donation to The Prince of Wales's Charitable Foundation. This year, over £2.5m will be donated to the Foundation, supporting good causes across the UK. Since 2009, you've helped to raise over £14m for initiatives such as the Duchy Future Farming Programme, which helps farmers develop more sustainable farming practices. Organic rocket, grown by specially selected farmers with a commitment to quality. Delicious in a salad with balsamic dressing and shavings of parmesan.